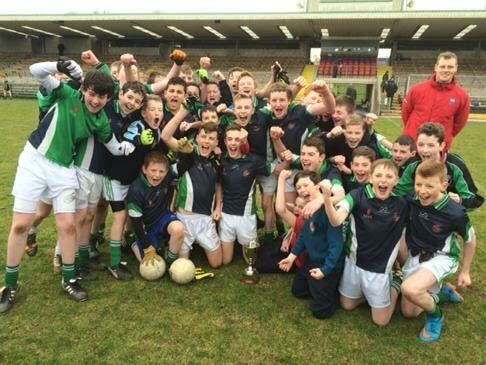 It was nail biting last ten minutes yesterday in Brewster Park when Cootehill had to hold onto a solitary point lead to be crowned U-14 Ulster Champions. Moville had a chance to send the game into extra time with the last kick of the game from a 13 metre free. Thankfully for St. Aidan's it just missed the target and it resulted in our lads picking up their first piece of Ulster silverware. It was a very entertaining affair with the lead swaying each way throughout. St. Aidan's were three points down at half time and went four down midway through the second half and it was looking like the Corn Mac Neasa Cup was heading towards the Inishowen peninsula. However, our lads refused to lie down and they played their best football in the last 20 minutes with Jamie Bannon scoring 1-4 in this period. Our best performers were Joseph Mc Quillan, Dillon Mc Collum, Oisin Doyle, Donal Keapock, Seamus O Reilly, Ryan Lynch, Dj Cassidy, Kaylan Jackson, Philip Mc Cabe, Jesse Holland and Jamie Bannon.